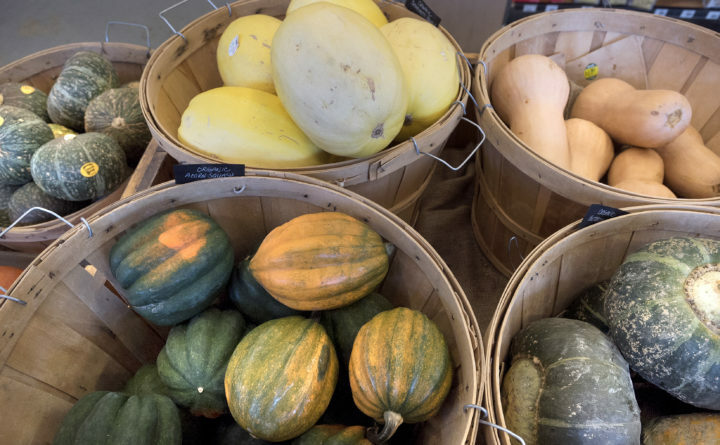 A variety of organic squashes available at the Tiller & Rye in Brewer. Pictured are from left, acorn and buttecup in the front row, orange kabocha, spaghetti and butternut squashes in the back. Though technically harvested in the fall, winter squash is great to cook all winter, as long as you store it in a cool, dry place. All you have to do is slice the gourd, scoop out the slimey, sinewy bits and separate the seeds (you can roast them later for a tasty snack). There are many different varieties of winter squash, each with their own distinct flavors. Here is your guide to some popular favorites that you might see in your local supermarket, winter farmers market or health food store. Spaghetti squash is an oblong and yellow with stringy innards that look like spaghetti. After roasting spaghetti squash halves, you can scrape out the insides with a fork, which can be eaten with sauce. The whole, uncut squash will keep for four to five weeks. On the outside, butternut squash is beige with a long stem and a bulbous tip, but the flesh is a scrumptious bright orange. Butternut squash is easy to peel, cube and store for roasting or for a hearty slow-cooker soup that can be prepared all winter long. It can also be roasted halved. If stored properly in a cool, dry location, this squash will stay good for up to six months. This tulipped green gourd with prominent ridges and yellow-orange flesh has a delicious sugary flavor. It is excellent stuffed or sliced and roasted with a variety of savory and sweet seasonings. Acorn squash has the shortest shelf life of the squash varieties at a mere four weeks, so cook it up quickly. Not to be confused with butternut squash, buttercup squash is usually green and round with a belly button-like protrusion. This creamy, slightly nutty squash is delicious roasted with apples. It can be slightly dry, but works great in recipes that bring out its moisture like soups or stews. The shelf-life for buttercup squash is around 13 weeks. Did you know that pumpkins are squash? Also known as the “pie pumpkin,” this round orange gourd is great for, well, pumpkin pies — but also for a variety of baked goods once you prepare it into a fresh pumpkin puree. The sweet squash is also great in savory dishes; try cubing and roasting in for salads or boiling it down for soup. The roasted seeds also make a delicious snack. Sugar pumpkins will keep for 8 to 12 weeks. Also known as Japanese pumpkins, these squash are green with light stripes and are usually slightly squatter than their more popular pie pumpkin counterparts. Kabocha squash is a staple of Japanese cuisine and is often fried up in vegetable tempura, but it is also tasty steamed or roasted with a sprinkle of oil, cinnamon, and salt. It substitutes well for sweet potatoes in many recipes. Kabocha squash lasts between four and five months in storage.